BOOK REVIEW So good you won't want it to Finnish. 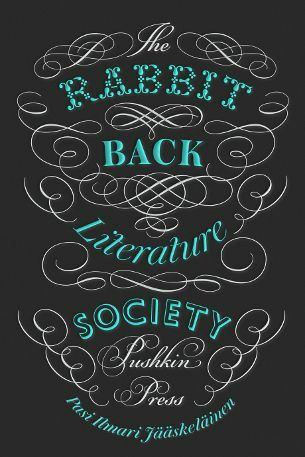 The Rabbit Back Literature Society book review. A novel about novelists writing novels. Um. Or maybe not. Far from being an ordnance survey map of the author’s navel, The Rabbit Back Literature Society is a lobster-pot of a book. It lures you in with an irresistibly quirky, witty opening and a huge Big Idea. Once inside, you’re trapped in the claustrophobic lives of the Society; nine wildly successful writers with a dark secret going back to their shared childhood in a hick town in rural Finland, where they were recruited and trained to be Great Authors by the weird, enigmatic Laura White. Twenty years later, a tenth member joins the Society, White mysteriously disappears, and the new recruit sets out to discover the truth. It could all be too godawful for words, and Pasi Jääskeläinen deliberately takes a huge risk. It pays off, mostly due to an exquisite balance of suspense, precision-engineered structure and darkly playful humour. What makes this book special is the blending of style and substance, the way the writer writes the writers, in a unique vein of fantasy-realism unlike anything else you’ve ever read. Jääskeläinen doesn’t explain or rationalise, and there are loose ends. Why is Martii’s house besieged by all the village dogs? What killed Ella’s father? Complete, comfortable resolution would be artificial; life’s not like that. Jääskeläinen creates a demilitarised zone between fiction and reality. It’s a dark, bewildering place, but fascinating. And fun .